As a part of the collections team, I walk through the storage room every day surrounded by thousands of objects. Today, as I was looking for a new object to write another Hidden Object Highlight post, I stumbled upon this item. I studied it; admiring its carved handle and wondering what a 17 inch fork would have been used for and by whom. As I looked through the Museum’s records, I found that this piece was originally from the Fiji Islands and was donated to Boston Children’s Museum in 1941 by a local man from Brookline. Looking over his records, I found that he was an avid donor, gifting the museum many items from all over the world. Then, I read on about what precisely this object was. “Cannibal Human-meat Fork” is its title. Cannibalism, in fact, was a part of the Fiji Islands history. It was a sacred part of tribal life that dates back to 2,500 years ago when bete (priests) or chiefs of a tribe would consume the flesh of enemies. It was thought that consuming them would be the ultimate obliteration of the individual, both physically and spiritually. Due to the fact that the bete was seen as a living representation of the Gods, they were not allowed to handle food at all. Typically, a servant would feed them and when it came to consuming human flesh, they used specially carved forks to feed themselves this sacred meal. In the 1830s Christian missionaries started arriving in the Islands and began converting Fijians to Christianity. Cannibalism dwindled once a majority of Fijians converted, but the tradition continued up until the 1860s. Today, Fijians recognize that cannibalism is a part of their history but do not continue to practice the religious ceremony. In Fiji the locals are benefiting from this past by carving souvenir forks and cannibal dolls for sale in tourist destinations. 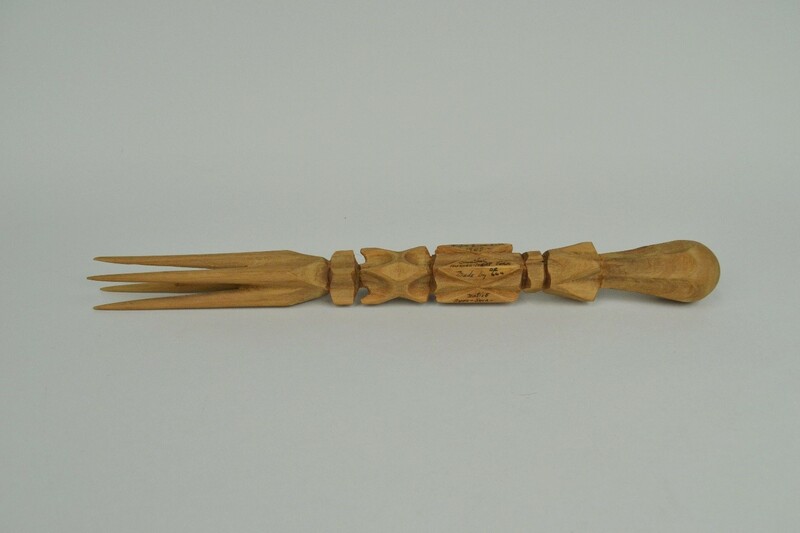 It is likely that this fork was never used to consume human flesh and was a souvenir from a trip abroad based on the printed date of 1939, 80 years after the practice of cannibalism ceased to exist in Fiji. Boston Children’s Museum holds collection objects that are surprising and often unassuming at first glance. Even working with the collections for the whole summer, I’m still finding objects that tell rich stories without being particularly eye-catching or grandiose in any way. It is incredible what you can discover when you look closer at an object. Come discover what else BCM has in its collection! Maybe you’ll find there is more than meets the eye. Crosbie, Emma. “Cannibal’s Fork from Fiji.” National Museum of Ireland. May 2013. https://www.museum.ie/The-Collections/Documentation-Discoveries/May-2013/Cannibal%E2%80%99s-fork-iculanibokola. “Cannibalism.” The Fiji Museum- Virtual Museum. 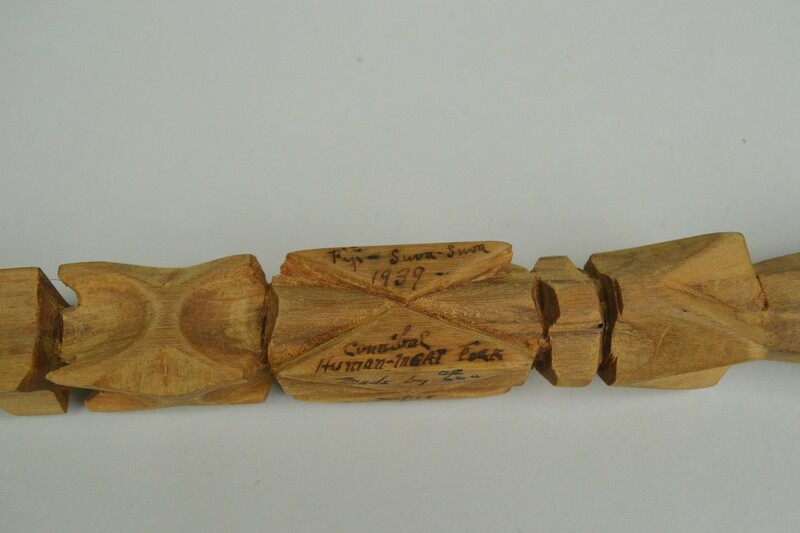 http://virtual.fijimuseum.org.fj/index.php?view=objects&id=67. Edwards, Anna. “Cannibals with cutlery: The macabre nineteenth century Fijian forks used by tribesmen to eat the bodies of rival warriors.” Daily Mail. January 9, 2013. http://www.dailymail.co.uk/news/article-2259519. “Souvenir/Fork.” The British Museum. http://www.britishmuseum.org/research/collection_online/collection_object_details.aspx?objectId=483012&partId=1&searchText=cannibal+fork&page=1.